Lightning goalie Ben Bishop ranks atop his U.S. counterparts in several statistical categories. Ben Bishop already had one brush with American history. He would not mind another. 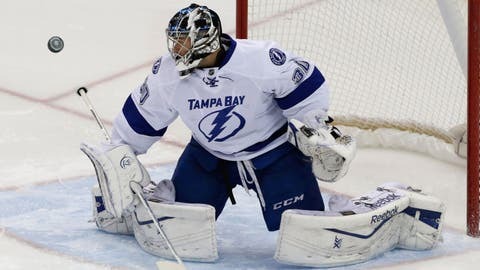 Entering the season, Bishop aimed to gain more experience and possibly take over the role as the Tampa Bay Lightning’s starting netminder. The 27-year-old accomplished that goal. But as his numbers continue to climb among the NHL’s league leaders, he finds himself frequently being mentioned as a candidate for the United States Olympic hockey team. Team USA will announce its roster Jan. 1. "It would be a tremendous honor," Bishop said. "Nobody can take that away from you if you’re an Olympian. You’re always an Olympian. It would be really neat. "It’s the Olympics. It’s the best of the best. If you have any chance to go, have any type of involvement, it’s pretty special." Born in Denver and raised in St. Louis, Bishop had his NHL career kickstarted — indirectly — thanks to a strange moment during the 2008 U.S. presidential campaign. Called up only days earlier and still seeking his first NHL appearance, Bishop was the St. Louis Blues backup when the team invited then-vice presidential candidate Sarah Palin to drop the first puck. Except when the Blues rolled out the red carpet for the hockey mom, starting goaltender Manny Legace tripped over it before the ceremony and pulled his groin. 38-year-old captain Martin St. Louis has put the Lightning on his back in the wake of Steven Stamkos' injury. "Danny Hinote came up to me and said, ‘Legace pulled his groin, be ready to go in,’ " Bishop recalled. "My heart dropped in my stomach. I thought I was going to throw up." Bishop, who said he was scared and nervous when he was on the bench days earlier during a game against the Detroit Red Wings, admitted to being thankful for the Palin mishap. "She definitely made it easier, because I didn’t have to think of [having to play] all day," Bishop said. Since that first appearance, the butterflies have dissipated. But finding full-time work at the NHL level has been difficult. In St. Louis, Bishop became the odd-man out when the Blues signed free agent Jaroslav Halak. Bishop was traded to Ottawa, but he found himself stuck behind a surging Craig Anderson on the Senators’ depth chart. The Lightning acquired Bishop in a trade last April for winger Cory Conacher. "A goalie trying to find his way to the NHL is not always going to be a perfect path, where you get drafted by a team, they develop you and you play. That’s not the way it works anymore," Bishop said. "I had a couple great general managers who were able to move me to places that I got a chance to play." This season, Bishop expected to split time in net with Anders Lindback. After training camp, that appeared to be the plan. Lindback started opening night, a 3-1 loss to the Boston Bruins. Bishop got his first start of the season two days later against the defending Stanley Cup champion Chicago Blackhawks. He backstopped the Lightning to a 3-2 shootout win at the United Center. "I just kept telling myself and everybody, it doesn’t matter how Anders plays, you’ve got to worry about yourself," Bishop said. "When you get the chance to play, go out and play well. Let your play do the talking." Bishop earned the next two starts and won both. By the middle of November, Bishop had a 13-2-0 record, which included two streaks of at least five straight wins. That pretty much solidified his role as the Lightning’s No. 1 goaltender. "There’s a lot of times where we’re reeling, or down a goal, trying to get back into it and the team is peppering us," Lightning coach Jon Cooper said. "He just makes those saves and we go down and score. "I guess it’s maybe this quiet confidence on the bench knowing — that’s unfortunate for Ben because he gets peppered a little bit — we have faith in each other. He has faith that we’ll come back in a game or protect a lead for him. And we have faith if we do break down, he’s going to stop the puck." Its that kind of synergy and success that has Bishop drawing attention as a potential Olympian. Florida Panthers general Dale Tallon, who is among the associate committee members advising Team USA general manager David Poile, noted Bishop is on the radar. "He’s had a great season," Tallon said. "He’s played very well. He’s obviously one of the many candidates the U.S. has in goal." But the strategy in building a team for Sochi, Russia, is still under discussion. Does Team USA bring goaltenders who are on a hot streak? Or will veteran experience and a history with Team USA carry greater weight? Bishop will have fewer than 100 NHL games to his credit when the selection is made. His international experience is limited — just six games at the World Championships. In terms of statistics, though, Bishop has been the only American goaltender find consistency across the board, and his numbers have dwarfed those of other candidates. Bishop’s 20 wins rank second in the NHL and first among U.S. netminders. The next closest candidates are Los Angeles’ Jonathan Quick and Ottawa’s Anderson with 10 each. Bishop’s 1.93 goals-against average and .935 save percentage, marks both ranking among the top 5 in the league, are also tops among his countrymen. New Jersey’s Corey Schneider comes in second with a 2.02 goals-against average, while Buffalo’s Ryan Miller save percentage is next with a .924 mark. It also does not hurt that Bishop is riding yet another win streak — this one also up to five — when Tampa Bay headed into the Christmas break. "It’s one of those things where if I don’t play well here, it’s not going to happen with the Olympic team," Bishop said. "It’s easy to focus on your games with the Lightning because that’s going to determine what’s going to happen if you make it or not." The Lightning host back-to-back games against the Montreal Canadiens and New York Rangers before the Olympic decision is made. "Hopefully I have a couple solid games before they make the decision and make it tough on them."